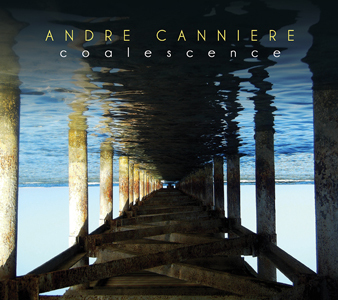 A MASTERLY new release from trumpeter and composer Andre Canniere, ‘Coalescence’ presents a strong quintet line-up and a fine collection of nine originals. Canniere’s debut with Whirlwind (‘Forward Space’, 2011) received numerous plaudits for its rock-driven jazz grooves. 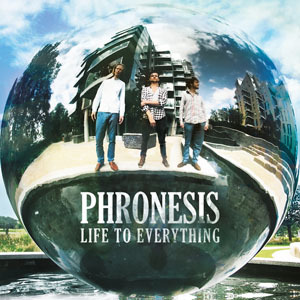 This new recording marks a shift to a more elaborate post-bop feel, displaying greater compositional eloquence… and delivered by a top team of Hannes Riepler (guitar), Ivo Neame (piano and accordion), Ryan Trebilcock (bass) and Jon Scott (drums). American-raised Canniere (based in London since 2008) consistently delivers a clear, bright trumpet tone, immediately making its mark on his confident, bustling opener, Sweden Hill – Ivo Neame’s piano a particularly brilliant rhythmic and textural core. Hans Riepler’s guitar tone and technique are vital ingredients in this album’s mix. As well as his nimble soloing, a fascinating ‘chemical reaction’ occurs when he either shares or harmonises a melody with Canniere. Their tones are surprisingly close, beginning to resemble a paired trumpet or trumpet/sax frontline, but with the added string attack that Riepler’s guitar can bring – a full and engaging sound. Gibbs and East is a great showcase for the trademark drumming of Jon Scott – a rock-solid, hard-edged, but also sensitive and imaginative player (heard with Kairos 4tet and Dice Factory) who provides the spectacular ‘snap, crackle and pop’ to a number which Canniere describes as his homage to Rochester, New York. Riepler comes to the fore in Nylon, providing pleasing guitar textures as well as a warm yet agile lead in a punchy and sometimes wonderfully clumping track in which Canniere bristles chromatically. In contrast, Gaslands – a commentary on the topical issue of US and UK fracking activity – finds Canniere soloing mournfully over a troubled backdrop of guitar wash and high piano elaboration. The eleven-minute Zuid is a brash and lively stand-out, opening with impressive, sonorous, flexing bass. Canniere positively flies on this (Hubbard-like), Scott and Trebilcock providing and maintaining its fabulous motion which intentionally suggests memories of train journeys through Europe. And Ivo Neame provides characteristic shape, reflection and embellishment. 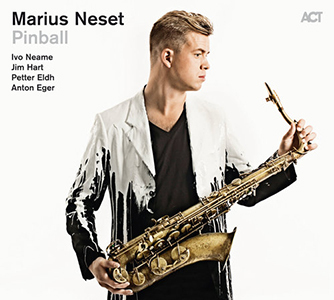 Neame is becoming something of a pianistic chameleon in differing line-ups, able to re-invent his ‘colour’ of play – yet his innate musicality and wizardry always reveal the identity of an artist who is so evidently at the top of his game. Parallax, from its first ear-catching guitar and bass riff, possesses a questioning, tentative air. As Trebilcock’s bass continues the same pulse, Canniere and Riepler freely expound on its subject of perceived change in perspectives, guitar and piano here a classy combination. 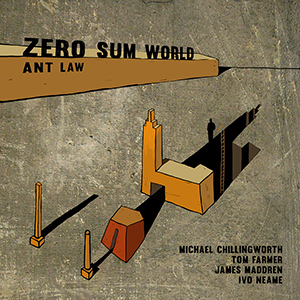 The more urgent, guitar-led Point Zero acknowledges Canniere’s abhoration of inadequate gun laws in the States, Scott’s straight-talking drums and Neame’s accordion giving weight to the trumpet line. Finally, Neame’s spacious and delightful countrified piano is a key element of the homely, closing, Pennsylvania-inspired Elk Run – mellowness and memories the watchwords from Canniere. This new quintet somehow has the ability to continually shed new light on their offering, the various nuances frequently revealing themselves differently each time – an indicator of their superb collaborative musicality. An excellent programme, and definitely a repeat player, ‘Coalescence’ is released on Whirlwind Recordings on 28 October 2013.